I've always enjoyed the 1992 film Newsies (with Christian Bale) but it has been said that it wasn't a success in the cinema back then. It actually was even nominated for the Razzie Award. 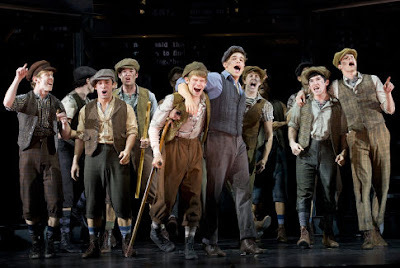 Through the release of the video and succeeding dvd, it has however garnered a cult following so it's not surprising that the current production at The Papermill Playhouse has been well attended and reviewed when it opened Sunday night. There's actually a buzz that it might open on Broadway next spring. Read this article by the New York Daily News on how the flop became a stage hit.